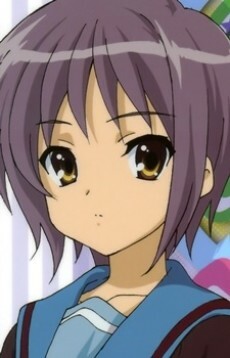 Yuki Nagato is a quiet high school freshman that is the only member of the SOS Brigade that was not "voluntarily arrested," or coerced into joining, by Haruhi Suzumiya. When Haruhi claimed the empty Literature Club as the SOS Brigade's clubroom, Yuki was found reading there. Haruhi claimed the clubroom and Yuki as part of the Brigade, both of which she didn't mind. She lives alone in the same apartment complex as Ryoko Asakura. She wears glasses and her school uniform at all times, only discarding the former after Kyon babbled that she was cuter without them and that he wasn't a 'glasses man', and the latter when the SOS Brigade went on vacation. Yuki is a "humanoid interface," or artificial human, created by the Integrated Data Entity for the purposes of interacting with and observing events on Earth. Specifically, she is assigned to observe Haruhi, who is the cause of an explosion of data that occurred when she used her godlike powers to recreate the world three years prior. As an artificial human, she has numerous paranormal abilities. She is capable of manipulating the properties of the environment and any materials within it at any scale to her desire, referred to as "bogus magic" by Kyon. For instance, she can create a baseball bat that only hits home runs, nullify data links (removing other artificial interface connections from their bodies), plus she is able to make a cover up story (since Ryoko was gone, she made a cover up story that she moved to Canada), and reconstruct a classroom, down to the last detail, after everything in it was completely destroyed. As a result, she is capable of feats of superhuman strength, agility, and stamina. In one instance, she was unfazed while impaled by multiple metal spikes, and effortlessly reconstructed her body afterwards. Her state also affords her an extreme level of intelligence. She can comprehend the rules and concepts of a game instantaneously, as well as create flawless strategies based on her observations, and was able to learn how to play a guitar mere moments after receiving one. Yuki has a very stoic and introverted personality, preferring simple body language rather than speaking. When prompted to speak, she does so in a very concise manner, always speaking in a monotone and displaying a dispassionate complexion. She thinks very rationally, and finds it difficult to communicate with normal humans due to her intelligence and lack of empathy. She enjoys reading, and is seen reading a book in the majority of her appearances. As the series continues, she develops a sense of humor, although her unchanging facial expressions make it near-impossible to discern whether she is joking or not. Despite her reserved manner, she is reliable and trustworthy, resulting in Kyon trusting her more than other members of the SOS Brigade. Yuki is described by Haruhi as the SOS Brigade's "indispensable silent character." She was neither recruited by nor did she join the Brigade but was actually included along with the room when Haruhi arrived and declared it as her own. Whenever she is in the club room, she is usually reading. Similar to Itsuki Koizumi, Yuki is obedient when orders are given; however, her loyalties lie more with Kyon rather than Haruhi. The other members often rely on Yuki and her abilities whenever needed most, notably when the SOS Brigade was losing in the baseball tournament, the contest against the Computer Society, and in the case of the Cave Cricket. Aside from this role, she is also responsible for Kyon's safety, as evident when she saved him from an attack by Ryōko, since Kyon's presence stabilizes Haruhi's emotions. In the SOS Brigade's amateur movie production The Adventures of Mikuru Asahina, Yuki was cast as the leading antagonist. She was portrayed as an alien, who could also use magic. Kyon also realized after the "cave cricket" incident that Yuki plays a "behind the scenes" role, making her one of the puppeteers whose goals are to ensure Haruhi is fully satisfied and that order and balance are maintained. Her intentions of being in the Brigade are to monitor Haruhi and prevent her from feeling bored or greatly disappointed because it is generally believed by the Integrated Data Entity that a drastic event that could end the universe would occur. It is also believed that Haruhi is also the key to evolution and thus it is important for Yuki and other humanoid interfaces to continue their observations. She also has the ability to detect any spatial changes in the environment caused by Haruhi and will act to prevent them from persisting. An example of this is during the unscripted attack in the first fight scene of the Brigade movie, when she tackled Mikuru in order to remove her contact lens which had temporarily caused the fictional "Mikuru Beam" to become real.